Early Registration Deadline This Friday! The early registration deadline for three introductory courses is this Friday, September 6th! Contact us or register online today to take advantage of the early registration rate! This weekend officially kicks off PRI’s fall 2013 schedule! Lori Thomsen is heading to Warner Robins, GA to teach Pelvis Restoration and James Anderson is teaching the first PRI Integration for the Home Health Clinician affiliate course in Salem, OR! Both courses are FULL! The majority of our September courses have already been confirmed, and I have started confirming October courses as well. If you are considering taking a PRI course before the end of the year, please check out the rest of the 2013 courses and register today! Spots are filling up! I am also adding 2014 course dates weekly, so check back often if you are wanting to get a head start on what courses you want to take next year! Dates Still Available for 2014! Are you interested in hosting a PRI course in 2014? I am still in the process of planning the 2014 course schedule, and there are several dates still available! If you are wanting to host, please contact me as soon as possible or fill out the Host A Course form online! This past weekend PRI had a booth at the Perform Better Summit in Chicago, IL. PRC Michael Mullin had a hands-on and lecture presentation during the Summit, which brought together 800 trainers, coaches and therapists from across the country. I had the opportunity to sit in on both of Michael’s great presentations, which were titled ” Principles of Postural Restoration for the Sports Clinician.” I had the chance to talk with many professionals who have heard about PRI through various blogs and websites, and I also met quite a few people who have already taken our courses! Please click here to see Michael’s presentation! Three recently scheduled courses for 2013 have been added to our website! I will also be starting to plan the 2014 course schedule in the next week, so please contact me or fill out a host form if you are interested in hosting! Early Registration Deadline Friday, May 10th! In the Round Rock, TX area? 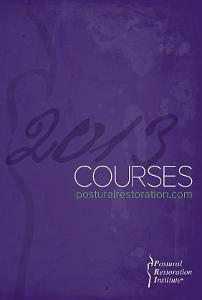 The deadline for the Myokinematic Restoration course, taught by James Anderson June 8-9, 2013, is this Friday, May 10th. If you are interested in attending, register now! Check out the Hruska Clinic’s Recommended Shoe List for 2013, plus a video from speaker Lori Thomsen!